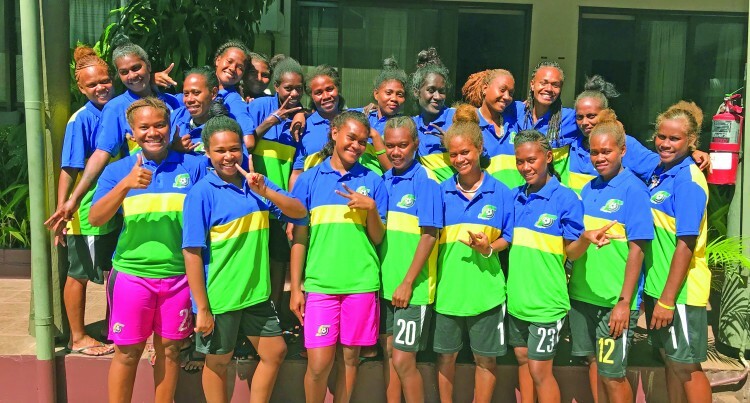 Lack of proper training facilities did not stop the Solomon Is­lands team from coming to Fiji to play in the OFC Women’s National Cup (OFCWNC) 2018 qualifiers. The qualifying tournament kicks-off at Churchill Park, Lautoka today and the young side aim to start with a bang against American Samoa at 12pm. “We don’t have a good training facility but we managed to put up a good team and I believe these girls have all it takes to be here for the qualifiers,” captain Crystal Annie told SUNsports yesterday. She said this is the first time for the players to travel abroad. Annie said their preparation phase had been going quite well. “We have worked really hard to come here,” Annie said. She said a win in their first match would indeed set the pace for the tournament. “A win will motivate us and boost the team morale. Coach Diane Justus was adamant they would grab the three points for the team despite not winning any previous qualifiers. The youngest player featuring for the team is 14- year-old Edith Nari. “I’m sure my girls will play well against American Samoa. We want to register the first three points for our side,” she said. Diane said that she had a predominantly young side and was hope­ful that these players got the exposure on the international arena as well. “We have the strength to put on a competitive match against our rivals. This will be a first ever experience for some of the girls and we want to leave a mark,” she said. Today: 12pm American Samoa v Solomon Islands; 3pm Vanuatu v Fiji, Monday: 12pm American Samoa v Vanuatu; 3pm Fiji v Solo­mon Islands. Thursday: 12pm Solomon Islands v Vanuatu; 3 Fiji v American Samoa.